When it comes to my tastes, be it in food, fashion, or film, I tend to be eclectic. I’m making Eggplant Carpaccio one moment and Bacon Burgers the next and just as easily could be found in pearls and cashmere as cowboy boots and my favorite old pair of jeans. 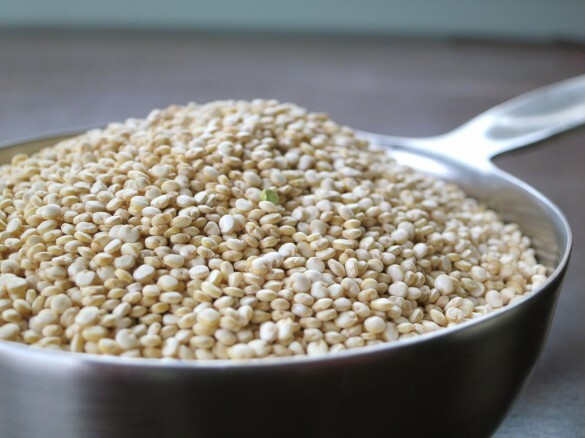 Quinoa: A magical grain if you ask me. There truly is no food or flavor that is off-limits in my book, but as the seasons change I find my cravings changing along with them. This time of the year when Spring is not yet in sight, and Fall is a distant memory I want to be transported to a land with exotic flavors. 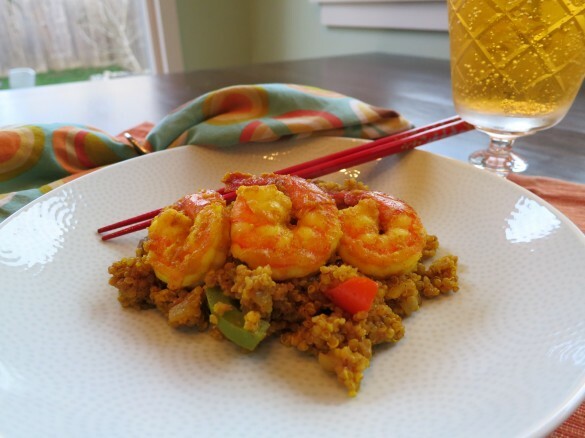 This Curry Quinoa, made with Coconut Milk, Bell Peppers, Mushrooms, and Jumbo Shrimp fits that bill to a T. Even better it can be made in less than thirty minutes and with just two pans. The leftovers reheat beautifully and are a great breakfast if you don’t mind starting off your day with a little kick. 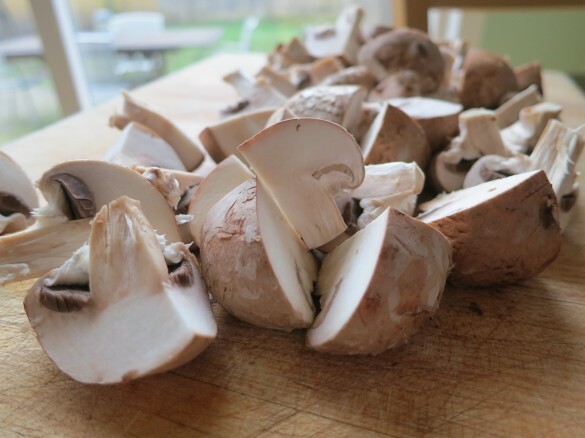 What do you cook to get you through the grays days of Winter? In a medium bowl, toss the raw shrimp with the lime juice and set aside. In a large liquid measuring cup measure 10 ounces coconut milk and add 8 ounces water to bring to 2 cups. Add in curry powder, sugar, 1 tsp Indian Saffron, and tomato paste. Stir well to combine. In a medium sauce pan over medium heat, heat olive oil. Add onion and cook until translucent, stirring occasionally, 3-5 minutes. Add the quinoa and cook, stirring frequently, until the grains are separate and golden. Add the coconut milk mixture, stir, and bring to a boil. Reduce heat and cover for 8 minutes. At 8 minutes, add the mushrooms in a layer (but don’t stir) and then top with the peppers. Return lid and cook until liquid is absorbed and vegetables are cooked but peppers are still crisp, about another 4-6 minutes. Remove from heat and keep lid on. In non-stick skillet heat remaining 4 ounces coconut milk over high heat. Add remaining Indian saffron and add shrimp to the pan, tossing frequently and cooking until pink and firm, but not over cooked about 2-3 minutes per side. When ready to serve, mix the vegetables into the quinoa and top with shrimp. Delicious with a vino verde wine. A perfect way to begin the week. Love these flavors!!!! Can Matt eat curry powder? I am with you – I think Quinoa is pretty magical myself. Alas, Matt cannot even do curry powder. He had to sit this one out I’m afraid. Oh Yum! 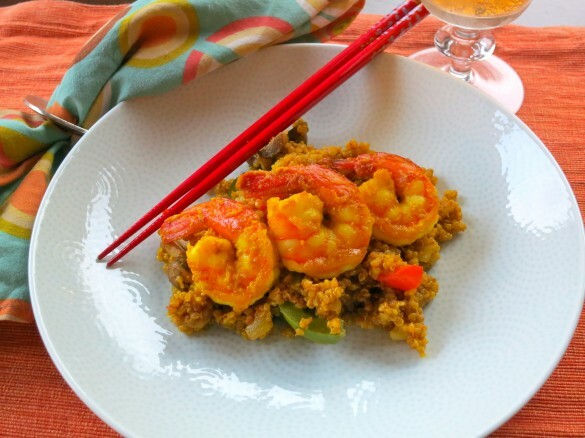 I love curry and shrimp, and what a great way to use quinoa. My husband just brought home a costco sized bag. I know what I’m doing with my quinoa this week 🙂 Hugs to ya! Thanks Albert! I’m eating leftovers for lunch as we “speak”. Can’t get enough of quinoa! This looks delish. Thanks Angie…I know…Quinoa appears to be everywhere. Do you know when it fully joined the scene? I feel like we weren’t hearing nearly as much about it 5 years ago. Love curry and quinoa! Great healthy dish. You said it Abbe. Healthy and tasty…a good way to start the week off right. Wow this sounds and looks really good. And I’d sure like to be transported out of cold and dark Ohio right about now. I can practically taste the coconut and saffron. Thanks Meghan. The cold and the dark is really trying, isn’t it? At least when I left work the other day at 5p it wasn’t pitch dark out. 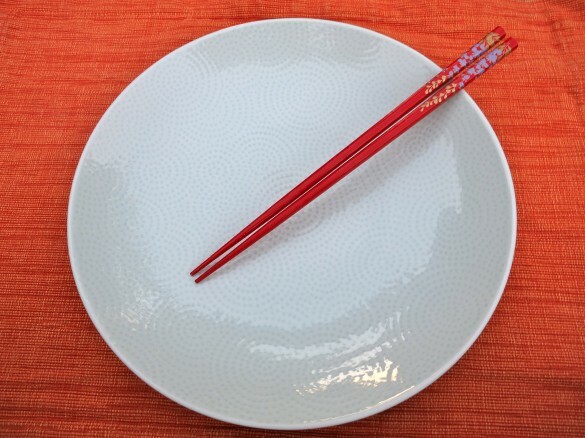 Spring is coming…we just need delicious food to get us there! I love the color of your shrimp! Delicious! The shrimp were the best part if you ask me! Love that Indian Saffron. Your curry quinoa looks truly delicious, Erina! These flavors will definitely carry us to spring. Although, yesterday was a pretty spring-like day…I even had the front door open for some breeze. Fingers crossed for today! I love that brief reprieve when you can open the doors and windows and pretend it’s not February. Soon, soon! Oh, YUM! I love the adding coconut milk to give a little sweetness to this dish. And quinoa is my new favorite food! Wow, this looks and sounds amazing and yes, I could definitely enjoy this any time of the day! this looks delicious! Curry = comfort and when it’s cold and windy in San Fran that’s exactly what I want. Can’t wait to try this!